Big Sky Cafe plans on turning "Wine Into Water" to help kick off World Water Week and bring attention to the need for clean drinking water in developing nations! Just purchase a bottle of sustainable wine (marked with an ) from our list for dinner during the designated days, and we will donate 20% to our adopted cause, charity:water. Not interested in a bottle? Drop you spare change in the wine bottle by our front door, and we will match your donation by 20%! It only takes $30 to supply clean water for one person's lifetime! Since 2009, Big Sky Cafe has been committed to the cause by raising enough money to help 520 people, see more info here. ​Please note: Sunday's BOGO special deal will not be valid on March 24th. Our carrot hummus is yummus. When carrots and chickpeas combine in a silky hummus at Big Sky Cafe, the delightful pairing, enlivened with a touch of cumin and lemon, is served with an herbed flatbread. It would also go well with crackers or vegetable dippers. The dish is served every day during dinner service at the cafe, a complementary amuse-bouche. It’s indicative of the top-shelf customer service regular diners have come to love. “The carrot hummus with an herbed flat bread is our version of bread service,” executive chef Dominic Weiss says. Click here to read the full article and get the recipe! Are you a socially conscious diner? 42 million Americans are food insecure, 1 in 9 Americans rely on food banks. And we can help change that. 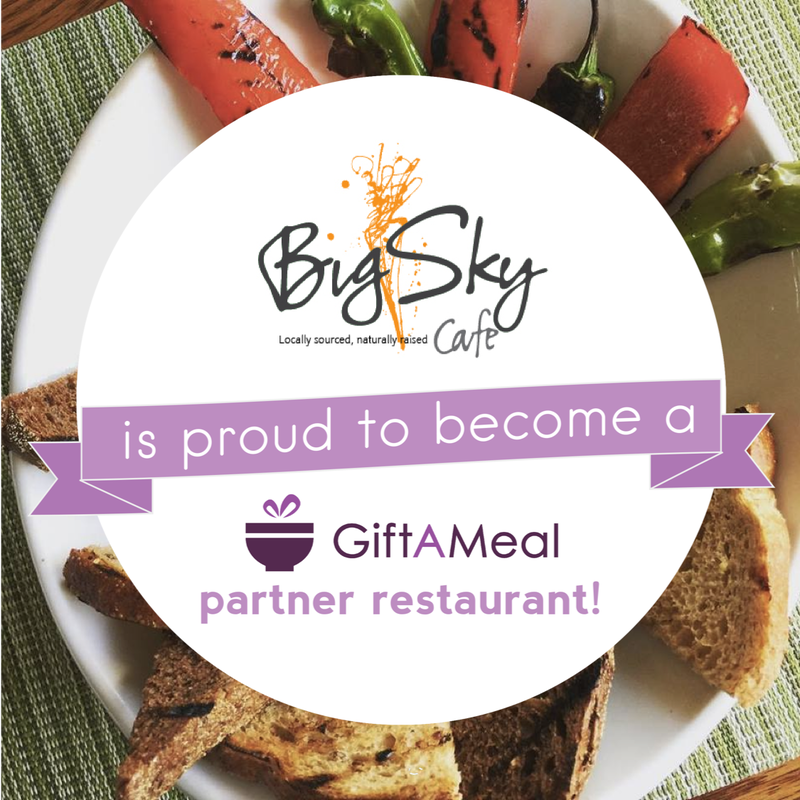 Big Sky Cafe is proud to announce our partnership with Gift A Meal - a mobile application that provides meals to the hungry in St. Louis. One meal is donated through Operation Food Search every time you share a picture of your meal within the app. If you share your picture on social media, an additional meal will be donated. Let's work together to help those who need it! Although we have been committed to sustainable practices for 20+ years now, we decided it was time to be certified! The Green Dining Alliance (GDA) works with restaurants in the St. Louis area to reduce their environmental impact. An audit is done to evaluate "reducing, recycling, and composting restaurant waste; operating facilities with efficiency; and sourcing sustainable food, to-go ware, and cleaning supplies." "Sustainability is part of the culture at Big Sky Café. After long conversations with wait staff, the owner, managers, and kitchen staff, they decided it was in line with their mission to move to compostable straws, and to only offer them on request. The whole staff is engaged with their environmental mission, from servers, who learn about the local farms their menu items are crafted from, to their kitchen staff, who waste nothing – creating masterpieces out of scraps and composting the rest." Read more about our report and evaluation here. Give the gift the gives to them and you! 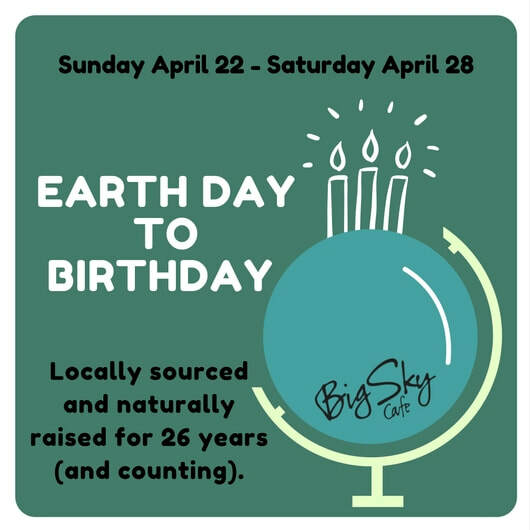 ​Since opening in 1992, Big Sky Cafe has always worked hard to better ourselves, the community, and the environment, in the every day the choices we make. Those choices appear in our sustainable and local food partners, in various recycling programs, and charity causes we support. With two important dates approaching on the calendar, and keeping our long standing mission in mind, we are going to celebrate the best way we know how: treating our friends and helping others! 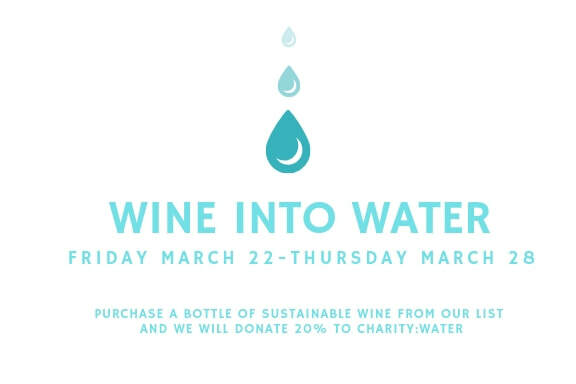 That's why when you purchase a bottle of selected sustainable wines during the week, we will donate 20% to our favorite cause, charity:water.org. Feeling generous? Match our donation and you automatically earn $15 to use at a future visit! Not only will you feel good about providing clean water to someone in need with your purchase, but every guest who purchases a bottle of sustainable wine will also have a chance to win nightly prizes! Congratulations to our nightly winners! ​How can you feed the hungry, contribute towards breast cancer research, fund pet adoptions, end global disease, promote autism awareness and provide clean drinking water? This December, put your money where your mouth (wine glass) is and attend the ONEHOPE, one night winter wine social. For just $35 a person, sample five wines paired with Big Sky specialty small plates all while doing good, because 50% of each bottle is donated to a specific cause. In addition, $1 to every ticket sold goes to our own adopted cause, charity:water. Advance Admission is required and can be purchased below. ONEHOPE Wine, a partnership with Robert Mondavi, Jr., is located located in Napa Valley, CA and has a strong commitment to the charities they support as well the quality of wine they provide. "Established in 1982, Montinore Estate is the second largest estate producer of wines made from Biodynamic® grapes in the country. With our 200-acre Demeter Certified Biodynamic® and Stellar Certified Organic vineyard located in north Willamette Valley in Oregon, we focus on producing superior Pinot Noirs, cool climate whites, and fascinating Italian varietals." Admission is $30 per person (not including tax) and must be purchased in advance online. SAVE $5 WHEN YOU USE "WINESOCIAL" AT CHECKOUT! It's a Beer Blow Out! for a Beer & Food Pairing event to celebrate St. Louis Craft Beer Week! Your prepaid admission gets you access to 8+ beers from Urban Chestnut paired with Big Sky Cafe specialties. We're turning #WineIntoWater for one week only, and all you need to do good is to drink wine! It only takes $30 to provide clean drinking water to someone living in an developing nation for 20 years. We've been proud supporters of clean water world wide, and with partnering with charity:water, we've provided over 400 people with that basic right. So with World Water Day on March 22nd, we want to do more. When you purchase a bottle of wine from our selected list from March 22-29, we will donate 20% of the list price to charity:water. Can't make it in? Donate online below. Once you donate, you will be able to follow the progress of your donation and the good it can do! Or you can always drop a few coins in the large wine bottle by the front door the next time you come see us. We will match your donation by a nickle for every quarter you drop in.